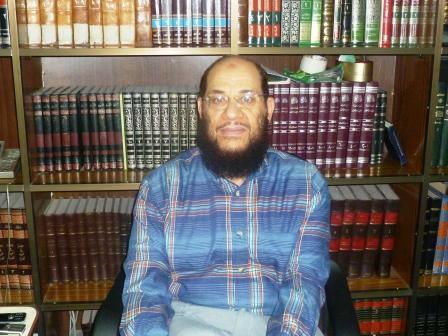 Sheikh Osama al-Qusi is a Salafi Muslim scholar in Egypt who has won a level of notoriety since the revolution. Prior to January 25, 2011, Salafis were a largely unknown and mostly silent religious trend in Egypt, with strength concentrated in Alexandria. Their theology encourages absolute submission to the ruling leader, while encouraging devout imitation of the early Islamic lifestyle. As such, they were marginal, though through the influence of Gulf-promoted satellite television their numbers increased steadily. After the revolution Salafis exploded on the scene urging a now democratic Egypt to construct itself as an Islamic state. Though democracy was traditionally a rejected concept theologically, pragmatic Salafis urged political participation to reorient a Muslim Egypt on the proper path. A number of their scholars became household names, most notably Mohamed Hassan and Safwat Hegazi, who became media figures and were encouraged by the ruling military council to intercede in sectarian conflict. Public reaction to Salafism has largely been negative, fearing the austere vision of Islam they promote, likening it to Afghanistan or Saudi Arabia. Yet the strength of their numbers is undeniable, though it is not at all certain they can translate this into political victory. Osama al-Qusi’s moderate celebrity has not come by riding this wave, but by criticizing it. While truly a Salafi, he finds the political machinations of his group, and other Islamists such as the Muslim Brotherhood, to be a severe departure from the Salafi spirit. Furthermore, he finds that in seeking to force implementation of an ancient paradigm Muslims risk running afoul not only of domestic and international realities, but also of the Prophet Muhammad himself. JC: I understand that Salafism, in its basic understanding, is an imitation of the Prophet Muhammad and his Companions, the Followers of these Companions, and then the Followers of the Followers, stretching three generations. Is this correct? OQ: Yes, Imam Malik ibn Anas, who was of the third generation and founded one of the four major legal schools in Sunni Islam, stated that nothing is useful for the latest Muslims, except that which was useful for the first Muslims. In Islam, it is understood that all the prophets completed one another, bringing one message. As such, the doctrines of Islam do not change from one generation to another, and similarly, neither do its values or principles. One of the issues between me and others lies in the fact that I understand Salafism to be a religion, while others make it out to be politics. But Islam in itself is not economic, nor physical, nor medical, though its values and principles inform all of these areas. There is no such thing as ‘athletic Islam’, for example. But in any sport there is a referee, who must preside over the game according to the rules therein. Islam’s values and principles do not set the rules of the game, but they do set the attitude of the referee, who keeps all in line. JC: But many Muslims maintain that everything is Islamic, and should be governed by religion. OQ: This is a new idea in Islam. It comes from Sayyid Qutb of Egypt, and Mawdudi of Pakistan, who were reacting to the fall of the Islamic Caliphate, and who wished to restore it politically. But Salafism is not politics; it is doctrine, principles, and morality. It is not the details of life; it is the purposes and not the means. The means of life change from one generation to another. JC: Why then do you maintain a long beard? OQ: In some of the hadith, Muhammad stated that men should grow their beards, which puts this in the category of religion, as a command. It is also mentioned that earlier prophets had beards, but furthermore, it is part of nature. God did not give men their beards for nothing, and it is not fitting for men to resemble women, or vice versa. We should preserve the natural order as God created it. The fact of God’s direct commands also applies to the hadd punishments of Islam, which are corporal in nature, such as cutting off the hand of a thief. Even so, I differ from many Muslims. Islamists say these punishments should be applied without distinction, while liberals say they were for a time and that we can change the punishment while keeping the principle. I am with neither group. God commanded these punishments just like he commanded men to pray; we cannot change his instructions. But at the same time, his instructions come with many distinctions that moderate its application. In such a manner, God’s commands are not found in other parts of life such as business, agriculture, or others. There are few proscriptions here, if any. We must figure these out on our own, in light of Islamic principles. JC: So you keep your beard like most Salafis, but you do not dress like them. What makes the difference? OQ: Yes, the hadith records that Muhammad wore a long white robe, but it does not record that he commanded others to do so. He simply did this because he received it from his parents, and there is no reason to necessarily dress this way from generation to generation. JC: Is this similar to the siwak (a traditional wooden shard used to clean teeth)? It was also used before Muhammad. OQ: In Islam there are five categories of action. There is wajib (duty), mustahib (desired), mubah (allowed), makruh (detested), and muharram (forbidden). Most scholars put the beard and the siwak in the category of ‘desired’. He ordered them to use the instrument they found around them, and today we have other instruments. The principle is to clean your teeth. Interestingly, if you look to areas where the siwak is found naturally, such as Yemen and Sudan, you notice that the people have very healthy teeth. This is in contrast to Egypt, for example, where it is not found. JC: But if the instrument of siwak can change, why with hadd punishments must you keep the means of cutting off hands? OQ: The problem with Islamists is not the means of punishment, but the application. For example, there is a hadith that states the thief’s hand is not cut off unless he steals a certain amount. There are other stipulations as well. In Islam there are only about five or so specific hadd punishments, while there is a broader category called ta’zeer (reprimand). In this category the punishment is left for man to determine, but with hadd, as mentioned, it comes from God’s direct command. In terms of the means of cutting off a hand, however, this can change from generation to generation. It used to be with a sword, but there is no reason it couldn’t be by laser, for example, to provide a cleaner, more sanitary cut. Some Islamists, though, say we have to apply the hadd punishments now, but this is not fitting, especially as there is so much poverty. During the time of Caliph Omar ibn al-Khattab there was a harsh famine, and he made the decision to suspend the hadd punishment of cutting of hands. As such, we should wait until the economic situation stabilizes, because then, if someone steals, he truly is a criminal, deserving of his punishment. Unfortunately, there is not much flexibility in many Islamists. Yet if we look at the life of Muhammad we see he lived through many different stages of life. Taking note, this provides flexibility in our understanding of the Qur’an and sunna. Many Islamists, however, take the final stage of Muhammad’s life, when he entered Mecca as a conqueror and governed as its ruler, and believe this period to abrogate his other teachings and behaviors. Yes, there is abrogation in Islam, but not of this manner, it comes in much more specific forms. In terms of his life, we should see how he behaved differently depending on his different circumstances, and learn from what he did. No, we cannot compare our situations exactly to his, but we can notice that when he was weak, he acted in one manner, and when he became strong, he changed his manner accordingly. An example that may guide Egypt today is when Muhammad first returned to Mecca as a pilgrim, with many followers, aiming to do the umra. The leadership of Mecca denied them, and many wanted to fight, but Muhammad instead secured the Treaty of Hudaybiya with Meccan leadership. According to the treaty he decided to leave, but would have the right to return as a pilgrim in one year’s time. Upon fulfillment, Muhammad and the Muslims conducted their pilgrimage rites marching around the Ka’aba, even though it was full of idols. Though these were anathema to the Islamic religion, he did not destroy them, since he had no authority to do so. Today, many Islamists want to apply the hadd punishments, but they do not consider if Egypt possesses the authority to do so. Islam may command certain matters, but it is not always possible to do everything we should in every time and place. For example, what if we apply the hadd punishments, but then the United States declares this is against human rights, and cuts off their grain supply? In Islam, we must always consider the overall interest. Can we apply the laws we want? Maybe, and maybe not – the world has become as one village. We must evaluate based on what is possible, with its consequences and benefits. All this must be weighed in light of Islamic values and principles. JC: Understood. But is not this reasoning similar to certain Islamists who delay the path to power, but desire it in the end? OQ: Islamists believe the Islam must result in the creation of a state, for governance. I do not. Yes, you are right, there are aspects of what we can accomplish now, and what we cannot. But Islamists – the Muslim Brotherhood and the Salafis – believe that they are the ones who should rise to power. There are two things to take into consideration: Egypt, and the Islamic state, which represents the Islamic religion, all Muslims, and does not currently exist. The Vatican is a Catholic state, and it is the only polity that can speak on behalf of Catholics, since there is no other pope. The Islamic caliph, however, is a civil and administrative position, not a religious one. He is not a man of religion, but of politics. He speaks on behalf of Muslims, representing them. Some institutions of the state are religious, like the Azhar, and need to have a Muslim presiding over them. But Egypt is not an Islamic state, so it does not need a Muslim administrative head. JC: But should it become an Islamic state? OQ: In Egypt there exist both Muslims and Christians, and each one must govern their own institutions. The administrative head must allow for both to do so. Egypt does not need to become a religious state, though this does not prevent religion from having its share in the state, especially in the religious laws that govern personal status. JC: But do not some of these laws, especially the hadd punishments, require a Muslim to implement them, since a Christian might not? OQ: The problem is that Islamists think the whole state must become religious, with them the ones to rule it. In their conception the Christians are our ‘guests’, not citizens. OC: In the Islamic state, this is correct. But we are speaking about Egypt. Today, Muslims have been constituted into many peoples and states, which is from the wisdom of God, who created different groups of people so as to get to know each other. JC: But should not the man of religion look to the ideal, and seek to implement it as much as possible? OQ: Yes, but the ideal is a state that encompasses all Muslims. This is not Egypt, and does not exist. It could be that in the future the Islamic states will unite as did the European states, and the president or caliph of that state will implement the hadd punishments in a moderate way. The problem is that people think Islam is politics. No, it is religion. JC: But is it also governance? OQ: No, not for me. Governance is a non-religious task. We should craft our state based on Islamic principles, but the sharia does not have the details to say what we should do in this situation, or that situation. Its unchangeable aspects, such as the details of a marriage contract, are few. If there is an Islamic state, the leader has the right to represent the Muslim people – all of them – but this does not exist. Even if it did, it would not apply Islamic laws on its non-Muslim people. The Qur’an states that Christians should judge themselves by what their book contains. JC: But Egypt now has an opportunity to craft its state as it wishes. Why not craft an Islamic state? OQ: Egypt is a Muslim state; it is not an Islamic state. I do not accept anyone manipulating religion or making a business out of it. Egypt used to be part of an Islamic state, but it itself is not an Islamic state. The president of Egypt must speak on behalf of both Muslims and Christians. OQ: No, it will still not speak for all Muslims in the world. JC: But what if it gradually unites them all? OQ: This is a good idea, and it is what I call for. Even so, it will not prevent any religious groups from practicing their religion within it. But for now, the president of Egypt does not have to be a Muslim, or a male. These were requirements of the caliphate, but not of the Egyptian state, which is a political and administrative institution. The best person should govern. Unfortunately, Islamists live in the past, but the past will not return along the same means as before; times have changed. If there is to be a caliphate, it must come by new means. In fact, there will be a caliphate, for Muhammad stated there would be a caliphate at the end of the world. At that time he predicted several stages the caliphate would enter – becoming like a possession handed from father to son, as in the Umayyad period, and then would become corrupted and fawn after the wisdom of the world, as in the Abbasid period. But how will the new caliphate come? There are many possible means. Perhaps one by one, or through the Organization of the Islamic Conference. But it will not come through the use of armies, as in the previous ages. But when it happens, then the state will be Islamic and the caliph must be Muslim, since he will represent all Muslims politically. In this situation, it will be the role of the state to protect religion, to keep it from growing weak. But returning to Egypt, take note again that Islam is a practical religion. It is not practical for Egypt to be an Islamic state. Why? Because most of us reject a religious state. Even many Muslim Brothers and Salafis reject the Iranian model of a religious state, for example, preferring the Turkish model. But there is also the Gaza model, and even the Hizbollah model, which is an armed entity within a state. I am not afraid if some religious trends take over government, since they will be governed by the realities of the international situation. Can any of these models be enacted in Egypt? Reality will dictate. Perhaps the Turkish model, since it has been successful, and has been enacted in stages. But it is not as if the Turks love Islam; no, before they hated religion, thinking it was the source of backwardness and ignorance. But as their situation stabilized and their economy developed, the people became happy. So it could be in Egypt, but whoever rules will have to deal with international realities, even if someone here or there calls for ‘ahl al-dhimma’. But no, the future of Egypt will be one of citizenship, which itself accords well with Islamic teaching. The word ‘dhimma’ comes from one with whom you have made an agreement or contract for protection, as seen in the Compact of Medina, where Muhammad first ruled over a polity of Muslims, pagans, and Jews. The concept of citizenship can be seen in his example, should it need to be justified religiously. JC: Is this reasoning similar to that of al-Afghani and Muhammad Abdo, who sought to modernize Islam by finding modern concepts within Islam’s ancient texts? OQ: Yes. These were good students of the Islamic school of reason, but at times they treated verses of the Qur’an as if they clashed with reason, and so sought a different explanation. I disagree; we must accept verses that our reason does not understand, and hope that someday we will. Rejection is out of the question. In this aspect sometimes the school of reason resembles the Mu’tazila of old (an early Islamic philosophical school) who went as far as to reject even certain parts of Islamic doctrine. It is not correct to raise divisions between reason and revelation. Instead, Muslims should return to the trusted path of Salafism. JC: Very good. But let’s return to the main subject. OQ: Yes, that’s right. Despite all that we are saying, I believe most Islamic currents, even the extremist ones, are adjusting to the times. If they do not learn from their texts, they will learn from reality. What I do not want to see from an Egyptian state is any law issued from parliament that goes against Islam or Christianity. JC: But wait, who will determine this? OQ: The parliament itself will. It is made up of Muslims and Christians. In parliament there exist many committees for different subjects – agriculture, trade. There should also be a religion committee for which members can refer to in questions of religion. I’m sure President Obama is not an expert in economic policy, but he has advisors on whom he leans for support. It should be the same way with our legislators, but ultimately, the decision only comes down to them. JC: So what if I want to eat publically during Ramadan? Can I do that, even if I am a Muslim? OQ: Well, let us look to the parliament; they have the authority to craft laws. Maybe they will decide to close restaurants during Ramadan. Maybe they will leave them open for Christians or tourists. Regardless, it is up to the people to decide through the parliament. Even if there were to be groups on the street (such as exist in Saudi Arabia, religious police), their function would be to advise people to respect the values of others. Their function could not be through law. There are no details in the sharia about what to do with restaurants in Ramadan, or what to do if people eat in the streets. JC: Shall we take an even more controversial topic, then? What about the freedom of a Muslim to change his religion, or to deny Islam? OQ: There are certainly references in the hadith that prohibit conversion from Islam, even to the point of proscribing death. But unlike the cutting off of hands, this is not found in the Qur’an. The key question is if there is anything that establishes the prohibition of leaving the faith as absolute, or relative to its time. The Qur’an describes a time when people were entering Islam but then leaving it quickly. This was done in an inappropriate manner, and may have even been instigating trouble. It would require more research to see if the hadith about killing an apostate are connected to this text. If so, it would have been to put a halt to this process, saying, ok, religion is not a game, make your decision and choose. So I expect, without being sure, that this hadith came for certain reasons at a certain time. This would accord with the fact that there are other verses which guarantee the freedom of choice in religion. In this and in many other issues, scholars consider context and previous understandings of the text. This demonstrates that the jurisprudence of Islam is very flexible. A good example is of Imam Shafa’i, a founder of one of the four main Sunni Islamic legal schools. He lived a long time in Iraq and issued many legal rulings. Yet when he came to Egypt he issued different rulings on the same questions. This shows he adapted his decisions to the environment he was in. These differences are part of the intellectual wealth of Islam. So, I agree completely with freedom of religion. It is fitting for this time, it is fitting internationally, and fitting in Egypt also. But, if someone is playing with religion, like as in the Qur’an account I mentioned, he is akin to acting like a spy, and should be so treated. But we cannot generalize this special case on freedom of religion in general. JC: Thank you Sheikh Osama. In respect of the time perhaps that will be sufficient for today. But I look forward to speaking with you again soon.